Colima (Spanish pronunciation: [koˈlima] ), officially the Free and Sovereign State of Colima (Spanish : Estado Libre y Soberano de Colima), is one of the 32 states that make up the 32 Federal Entities of Mexico. It shares its name with its capital and main city, Colima. Colima is a city that is the capital of the Colima state and the seat of Colima municipality, located in central−western Mexico. The Revillagigedo Islands or Revillagigedo Archipelago are a group of four volcanic islands in the Pacific Ocean, known for their unique ecosystem. They lie approximately 390 kilometres (240 mi) southwest of Cabo San Lucas, the southern tip of the Baja California Peninsula, and 720 to 970 kilometres west of Manzanillo. They are located around 18°49′N112°46′W. Technically part of the Mexican state of Colima, the islands are under Mexican federal jurisdiction. The state covers a territory of 5,455 km2 and is the fourth smallest federal entity after Tlaxcala, Morelos and the Federal District of Mexico City, containing only 0.3% of the country's total territory. 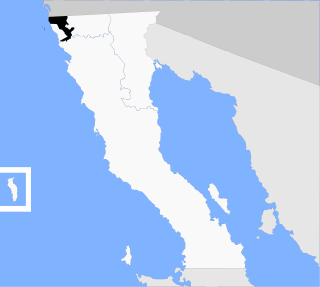 The state is in the middle of Mexico's Pacific coast, bordered by the Pacific Ocean and the states of Jalisco and Michoacán. Tlaxcala, officially the Free and Sovereign State of Tlaxcala, is one of the 31 states which along with the Federal District make up the 32 federative entities of Mexico. It is divided into 60 municipalities and its capital city is Tlaxcala. Morelos, officially the Free and Sovereign State of Morelos, is one of the 32 states, which comprise the 32 Federal Entities of Mexico. 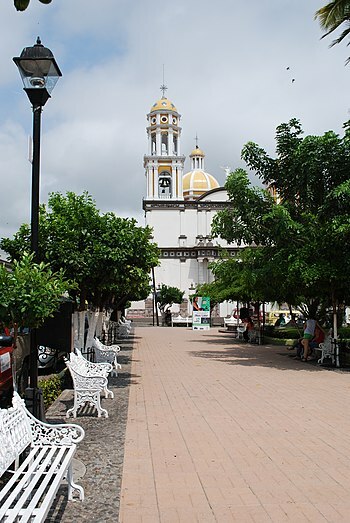 It is divided in 36 municipalities and its capital city is Cuernavaca. 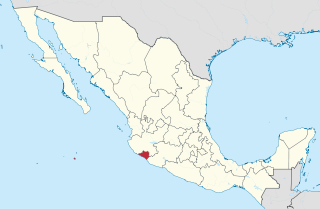 Manzanillo is a city, seat of Manzanillo Municipality, in the Mexican state of Colima. 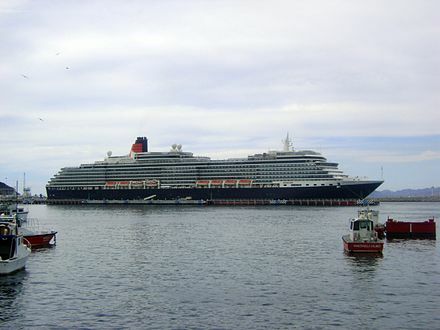 The city, located on the Pacific Ocean, contains Mexico's busiest port that is responsible for handling Pacific cargo for the Mexico City area. It is the largest producing municipality for the business sector and tourism in the state of Colima. Politically, the state is divided into ten municipalities. Natural geography divides the state into a northern and southern region. The north has a cooler climate due to the higher mountains. The south is hotter and includes the Pacific Ocean coastline. The Revillagigedo Islands, of volcanic origin, are dispersed along the 19° north parallel over an area of about 400 km2—with a total landmass of 205 km2. The Volcán de Colima, 3,820 m (12,533 ft), also known as Volcán de Fuego, is part of the Colima Volcanic Complex (CVC) consisting of Volcán de Colima, Nevado de Colima and the eroded El Cántaro. It is the youngest of the three and as of 2015 is one of the most active volcanos in Mexico and in North America. It has erupted more than 40 times since 1576. One of the largest eruptions was on January 20–24, 1913. 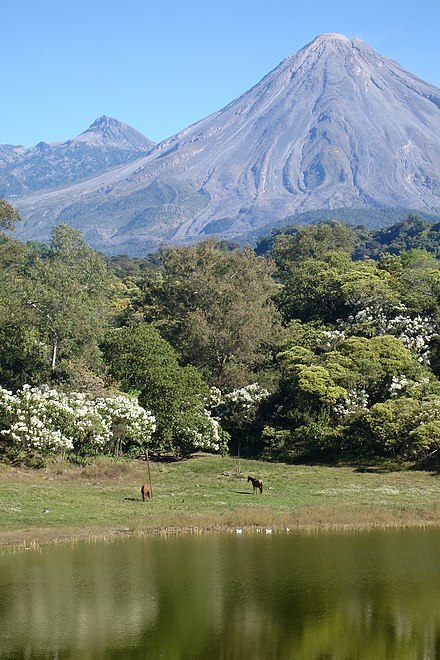 Nevado de Colima, also known as Tzapotépetl, lies 5 kilometres (3.1 mi) north of its more active neighbor and is the taller of the two at 4,271 meters (14,015 ft). It is the 26th-most prominent peak in North America. The most popular folk dances in the state include some that tell the story of the Spanish conquest—under various names, such as conquista,Virgin of Guadalupe,capotes, and the fox. Another popular dance is called apaches. These originated in the colonial period, along with moros y cristianos and matachines. Dances with indigenous roots include sonajera india and morenos. The state was home to a number of pre-Hispanic cultures as part of Western Mexico. Archeological evidence dates human occupation of the area as far back as 1500 BCE, with sites here contemporary with San Lorenzo on the Gulf Coast and Tlatilco in the Valley of Mexico. One period of the area's development is called the Los Ortices era, which began around 500 BCE. During this time the elements that characterize the pre-Hispanic peoples of Colima appear, including shaft tombs and a distinctive ceramic style called rojo bruñido, or burnished red. Tecomán is a city and seat of the municipality of Tecomán in the Mexican state of Colima, about 50 km south of the city of Colima. In the 2005 census the city had a population of 112,726 people. It is the third-largest community in the state of Colima. The municipality has an area of 834.77 km². Near the coast on Federal Highway 200, it is situated a rich agricultural industries region and is known as the "lime capital of the world". Due to its soaring homicide rate, Tecomán became the deadliest municipality in Mexico in 2016. Tijuana Municipality is a municipality in the Mexican state of Baja California. Its municipal seat is located in the city of Tijuana. According to the 2010 census, the municipality had a population of 1,559,683 inhabitants, of whom 1,300,983, or 83.4%, lived in the city of Tijuana. The municipality maintained its position as 3rd most populated nationally as of 2015 census, only behind Ecatepec de Morelos and Iztapalapa. Carlos Bustamante Anchondo of the PRI is the current municipal president. The municipality comprises the largest part of the Tijuana metropolitan area. Coacalco de Berriozábal is a city and municipality located in the State of Mexico, Mexico. 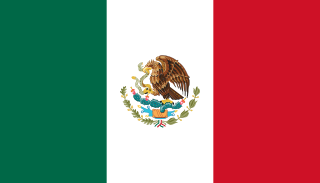 Its name comes from the Nahuatl, Coa-coatl (snake), cal-calli (home) and -co (at), meaning "at the house of the snake", and was first recorded in 1320. The municipality lies in the Greater Mexico City conurbation, and it is located next to the northern tip of the Mexico City. The official name of its municipal seat is San Francisco Coacalco, and the municipality is named after Felipe Berriozábal. 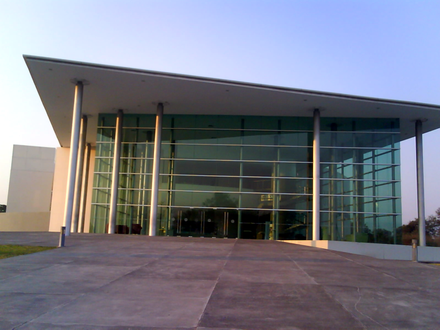 Ciudad de Villa de Álvarez is a city in the Mexican state of Colima. It is the municipal seat of Villa de Álvarez municipality. The city is adjacent to the northwest side of the state capital city of Colima and the two can be considered as "twin cities", with Ciudad de Villa de Álvarez having a 2005 census population of 97,701 and Colima having a population of 123,597. They are both part of the Colima-Villa de Álvarez metropolitan area, which includes the population of Colima municipality (132,237) and Villa de Álvarez municipality (100,121). The city and the municipality of Villa de Álvarez both rank third in the state in their respective categories in population, behind only Colima itself and Manzanillo. Villa de Álvarez municipality has an area of 428.4 km². The 2003 Colima earthquake occurred on 21 January with a moment magnitude of 7.5 and a maximum Mercalli intensity of VIII (Severe). The epicenter was located on the Pacific coast in the Mexican state of Colima. The earthquake was felt as far away as Mexico City and in southern parts of the United States. 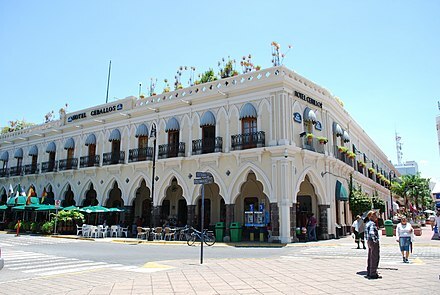 Armería is a municipality in the south-central part of the Mexican state of Colima. Ciudad de Armería is a city and the seat of Armería municipality. The municipality reported 29,599 inhabitants in the 2015 census and has an area of 341.60 km². Its municipal seat is Ciudad de Armería. Minatitlán is a municipality of the Mexican state of Colima. Its municipal seat is the city of Minatitlán, Colima. Its principal economic activities are farming, ranching and mining. 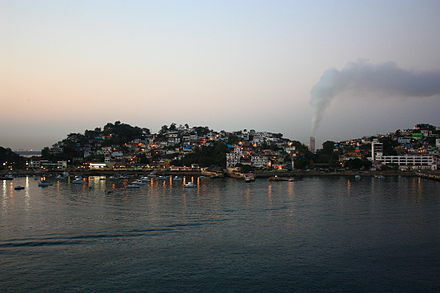 Minatitlán borders the state of Jalisco to the northwest, the municipality of Manzanillo to the southwest, and the municipalities of Coquimatlán, Villa de Álvarez, and Comala to the southeast. The First Federal Electoral District of Colima(I Distrito Electoral Federal de Colima) is one of the 300 Electoral Districts into which Mexico is divided for the purpose of elections to the federal Chamber of Deputies and one of two such districts in the state of Colima. The Second Federal Electoral District of Colima(II Distrito Electoral Federal de Colima) is one of the 300 Electoral Districts into which Mexico is divided for the purpose of elections to the federal Chamber of Deputies and one of two such districts in the state of Colima. Tekom Municipality is a municipality in the Mexican state of Yucatán. Tekom is also the name of the municipality's largest settlement and seat of the municipal government. In the XII national census conducted by INEGI in 2000, Tekom municipality recorded a population of 2,660 inhabitants. In the intermediate census count undertaken by INEGI in 2005, the total municipal population was recorded as 2,933 inhabitants, 2,413 of whom spoke one of the recognised indigenous languages of Mexico. Tancanhuitz is a town and one of the 58 municipalities of the state of San Luis Potosí in central Mexico. It is located in the southeastern part of the state, approximately 330 km (210 mi) from the city of San Luis Potosí. The municipality covers an area of 134.05 km². As of the 2005 census, the it had a total population of 20,495, of which 10,180 were men and 10,315 were women. ↑ "Portal Ciudadano de Baja California" (in Spanish). ↑ "El Comentario" (in Spanish). Archived from the original on 2010-08-10. Retrieved 2010-04-28. ↑ "Senadores por Colima LXI Legislatura". Senado de la Republica. Retrieved October 20, 2010. ↑ "Listado de Diputados por Grupo Parlamentario del Estado de Colima". Camara de Diputados. Retrieved October 20, 2010. ↑ "Resumen". Cuentame INEGI. Archived from the original on May 13, 2013. Retrieved February 12, 2013. ↑ "Colima". 2010. Retrieved October 20, 2010. 1 2 3 4 5 6 7 8 9 10 11 12 "Medio Físico" [Environment]. Enciclopedia de los Municipios de México Colima (in Spanish). Mexico: Instituto Nacional para el Federalismo y el Desarrollo Municipal and Gobierno del Estado de Colima. 2005. Archived from the original on March 27, 2012. Retrieved July 29, 2011. 1 2 3 4 5 6 "Resumen" [Summary] (in Spanish). Mexico: INEGI. Retrieved July 29, 2011. ↑ "Regionalizacion" [Regions]. Enciclopedia de los Municipios de México Colima (in Spanish). Mexico: Instituto Nacional para el Federalismo y el Desarrollo Municipal and Gobierno del Estado de Colima. 2005. Archived from the original on March 27, 2012. Retrieved July 29, 2011. ↑ "Nevado de Colima, Colima" (in Spanish). Mexico Desconocido magazine. Retrieved July 29, 2011. ↑ Jiménez González, Victor Manuel, ed. (2009). Colima:Guía para descubrir los encantos del estado[Colima: Guide to discover the charms of the state] (in Spanish). Mexico City: Editorial Océano de México SA de CV. p. 30. ISBN 978-607-400-172-3. ↑ "Territorio" [Territory] (in Spanish). Mexico: INEGI. Retrieved July 29, 2011. ↑ "Mexico: extended population list". GeoHive. Archived from the original on 2012-03-11. Retrieved 2011-07-29. 1 2 3 4 5 6 "Perfil Sociodemográfico" [Sociodemographic profile]. Enciclopedia de los Municipios de México Colima (in Spanish). Mexico: Instituto Nacional para el Federalismo y el Desarrollo Municipal and Gobierno del Estado de Colima. 2005. Archived from the original on March 27, 2012. Retrieved July 29, 2011. ↑ "Número de habitantes" [Number of inhabitants] (in Spanish). Mexico: INEGI. Retrieved July 29, 2011. 1 2 3 4 5 6 7 8 9 10 11 12 13 14 15 16 17 18 19 20 21 22 23 24 25 "Historia" [History]. Enciclopedia de los Municipios de México Colima (in Spanish). Mexico: Instituto Nacional para el Federalismo y el Desarrollo Municipal and Gobierno del Estado de Colima. 2005. Archived from the original on March 27, 2012. Retrieved July 29, 2011. 1 2 3 4 5 6 7 "Actividad Económica" [Economic activity]. Enciclopedia de los Municipios de México Colima (in Spanish). Mexico: Instituto Nacional para el Federalismo y el Desarrollo Municipal and Gobierno del Estado de Colima. 2005. Archived from the original on March 27, 2012. Retrieved July 29, 2011. 1 2 3 4 5 6 7 8 9 10 11 12 13 "Infraestructura Social y de Comunicaciones" [Social Infrastructure and Communications]. Enciclopedia de los Municipios de México Colima (in Spanish). Mexico: Instituto Nacional para el Federalismo y el Desarrollo Municipal and Gobierno del Estado de Colima. 2005. Archived from the original on March 27, 2012. Retrieved July 29, 2011. ↑ "Conociendo Villa de Álvarez" [Getting to know Villa de Alvarez] (in Spanish). Colima, Mexico: Secretaria de Turismo de Colima. Retrieved July 29, 2011. 1 2 3 Kalosh, Anne (August 2002). "From cargo to cruise". Latin Trade. 10 (8): 66. 1 2 3 4 5 "Conociendo Manzanillo" [Getting to know Manzanillo] (in Spanish). Colima, Mexico: Secretaria de Turismo de Colima. Retrieved July 29, 2011. 1 2 3 4 Xóchitl América Contreras Vázquez (2006). Globalización, expansión urbana y vivienda en los municipios de Colima y Villa de Alvarez (PDF) (MA thesis). Universidad de Colima. Retrieved July 29, 2011. ↑ "Conociendo Coquimatlán" [Getting to know Coquimatlán] (in Spanish). 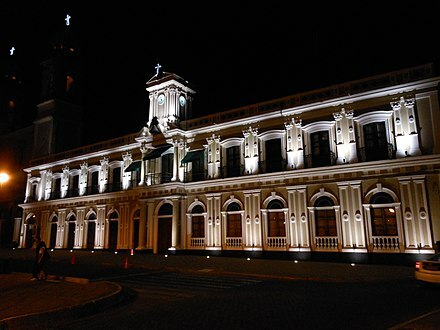 Colima, Mexico: Secretaria de Turismo de Colima. Retrieved July 29, 2011. ↑ "Conociendo Tecomán" [Getting to know Tecomán] (in Spanish). Colima, Mexico: Secretaria de Turismo de Colima. Retrieved July 29, 2011. ↑ "Colima" (in Spanish). Mexico: INEGI. 2010. Retrieved July 29, 2011. ↑ "Actividades económicas" [Economic activities] (in Spanish). Mexico: INEGI. Retrieved July 29, 2011. 1 2 3 4 "Sectores Productivos del Estado" [Productive sectors of the state] (in Spanish). Colima, Mexico: State of Colima. Retrieved July 29, 2011. 1 2 "Artesanías" [Handcrafts and folk art] (in Spanish). Colima, Mexico: State of Colima. Retrieved July 29, 2011. ↑ Alfredo Quiles (April 25, 2011). "Reportan saldo blanco tras vacaciones en Colima". El Universal (in Spanish). Mexico City. Retrieved July 29, 2011. 1 2 3 4 5 "Monumentos Historicos" [Historic Monuments] (in Spanish). Colima, Mexico: State of Colima. Retrieved July 29, 2011. ↑ "Conociendo Comala" [Getting to know Comala] (in Spanish). Colima, Mexico: Secretaria de Turismo de Colima. Retrieved July 29, 2011. 1 2 3 4 5 6 7 8 "Fiestas, Danzas y Tradiciones" [Festivals, Dances and Traditions] (in Spanish). Colima, Mexico: State of Colima. Retrieved July 29, 2011. 1 2 3 4 5 6 "Costumbres, fiestas y tradiciones (Colima)" [Customs, festivals, and traditions (Colima)] (in Spanish). Mexico City: Mexico Desconocido magazine. Retrieved July 29, 2011. ↑ Wendy Devlin (February 16, 2007). "Alejandro Rangel Hidalgo – Universal artist from Colima". Mexconnect newsletter. ISSN 1028-9089 . Retrieved July 29, 2011. ↑ Jiménez González, Victor Manuel, ed. (2009). Colima:Guía para descubrir los encantos del estado[Colima: Guide to discover the charms of the state] (in Spanish). Mexico City: Editorial Océano de México SA de CV. p. 14. ISBN 978-607-400-172-3. ↑ Jiménez González, Victor Manuel, ed. (2009). Colima:Guía para descubrir los encantos del estado[Colima: Guide to discover the charms of the state] (in Spanish). Mexico City: Editorial Océano de México SA de CV. pp. 14–17. ISBN 978-607-400-172-3. 1 2 "Ventajas Competitivas del Puerto" [Competitive advantages of the Port] (in Spanish). Colima, Mexico: State of Colima. Retrieved July 29, 2011. ↑ "Aeropuerto de Colima" [Colima Airport] (in Spanish). ASA. Retrieved July 29, 2011. ↑ "Aeropuerto de Colima" [Colima Airport] (in Spanish). Aeropuertos del Mundo. Retrieved July 29, 2011. 1 2 3 4 5 6 7 8 "Conociendo Colima" [Getting to know Colima] (in Spanish). Colima, Mexico: Secretaria de Turismo de Colima. Retrieved July 29, 2011. 1 2 "Nomenclatura" [Nomenclature]. Enciclopedia de los Municipios de México Colima (in Spanish). Mexico: Instituto Nacional para el Federalismo y el Desarrollo Municipal and Gobierno del Estado de Colima. 2005. Archived from the original on March 27, 2012. Retrieved July 29, 2011. 1 2 3 Jiménez González, Victor Manuel, ed. (2009). Colima:Guía para descubrir los encantos del estado[Colima: Guide to discover the charms of the state] (in Spanish). Mexico City: Editorial Océano de México SA de CV. p. 29. ISBN 978-607-400-172-3. ↑ "Historia de la Diócesis" [History of the Diocese] (in Spanish). Colima, Mexico: Diocese of Colima. Retrieved July 29, 2011. ↑ "52 ejecutados en Colima en cuatro meses" [52 executed in Colima in four months]. Colima Noticias (in Spanish). Colima, Mexico. Retrieved July 29, 2011. ↑ "Historia" [History] (in Spanish). Colima, Mexico: University of Colima. Archived from the original on September 13, 2008. Retrieved July 29, 2011. ↑ "Historia" [History] (in Spanish). Colima, Mexico: Instituto Tecnológico de Colima. Retrieved July 29, 2011. ↑ El acto de hermanamiento de la ciudad de Colima con San Cristóbal de La Laguna se celebra el próximo 2 de mayo. Wikimedia Commons has media related to Colima .